During the Fort Lauderdale boat show, New York-based design house Persak & Wurmfeld introduced a new schooner sailing yacht series, in collaboration with superyacht builder Derecktor Shipyards. The concept for the 44m Persak & Wurmfeld-designed schooner was introduced last year, but the expansion of the series with a new 36m yacht and the design team's and Derecktor's shared mission to bring superyacht building back to the northeast US is all new. Persak & Wurmfeld (P&W) has also refreshed the design of the 44m performance schooner sailing yacht and showed the new model off at the Fort Lauderdale boat show. The updated design reinforces the strong structural forms of the original 44m yacht – including the interesting profile that resembles a single wave with a handrail that is aligned with the changing flow of the deck – with the advent of a new transom. The previous square transom has been replaced with an aft-sloping deck that continues the wave form to the water line. The schooner series is also inspired by Bucket-racing sailing yachts, the 44m is designed to be a true ocean-going performance yacht while the new 36m schooner is envisioned as the ultimate bucket racer. 'The 36m inspiration was the introductory bucket racer – smaller, less volume, but all the same performance benefits, with the lifting keel as well,' says. 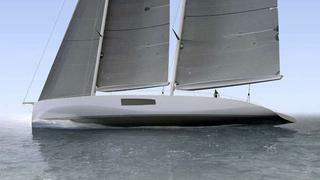 He also notes that the organic forms, such as that of the deck design of the P&W schooner series, are also well-suited to composite builds, and that noise and vibration better with composite than aluminium-deck racing yachts. Derecktor and P&W forged their relationship during the build of 85.6m superyacht Cakewalk, when P&W was brought on in late 2010 to serve as project engineer for the closing years of the significant project. 'We share the common desire to bring the building of large sailboats back to America,' Brewer says. 'Many bucket-racing yacht owners are American, but sailboats are built in other parts of world; we want to bring owners American-built bucket sailboats. The mast and rig will be all carbon fibre, and Persak & Wurmfeld have designed an easily managable rig that will offer cruising and racing capabilities while a lifting keel raises from 6m to 3.65m in the 44m yacht and from 5m to 3m in the 36m version. The primary naval architecture of the P&W's schooner series is complete, and Derecktor predicts an 18-month to two-year build time for the yacht. Derecktor's Florida refit-focused yard has stayed busy, recently completing the refit of the 43.2m Troy-built explorer yacht Big Blue, and the refitted famed classic 46m Feadship The Highlander is expected to launch this December.